So here goes another (belated) Happy Birthday Steve and Lane! If I have failed to mention anyone else's birthday, please let me know! And don't feel offended ... if no one reminded me, my own birthday would pass unnoticed. Thus I depend on Cristina to remind me. Now Cristina... if you ask her, she doesn't even remember how old she herself is (I kid you not... well, she knows within a range of +/- 2 years). So you see that we have real problems. I wonder who will take care of us when we get feeble(r)? "Winter" in Rio de Janeiro is a relative concept: while average and maximum temperatures are definitely much cooler than summer, you can still get some really warm days (although at night it can get downright cold). The nightly spell of cold air means that, even if the sun is hot tomorrow, the pool water will continue to be icy. It will probably be September or October before anyone will dare enter the pool again, which is a shame, since on warmer days the pool can seem inviting. Winter in Rio can be just cold enough to keep people on the beaches and out of the water. But when "arctic air" pushes up from Argentina, and the skies are cloudy, temperatures can plummet. A lot of tourists are caught by surprise, with only shorts and short-sleeve shirts. This time of year, Cariocas head to the mountains, dig out their sweaters, hats, gloves and heavy coats (usually bought while in New York on vacation), and make fondue. We spent last weekend in Saquarema, and miraculously the weather was mostly spectacular. The clear skies and hot sun meant the kids could spend the days on the beach; a taste of summer in mid-winter. 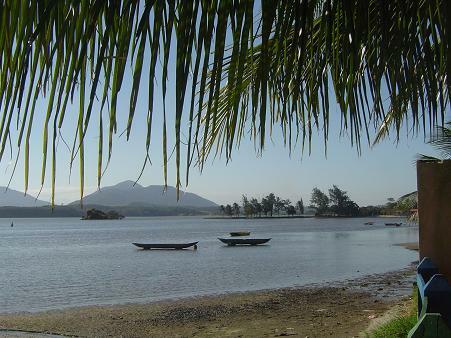 Saquarema is a sleepy little beach town about 40 miles up the coast from Rio de Janeiro. It's greatest claim to fame are its waves, which attract surf championships and surfers from all over Brazil and the world. A few months ago, Saquarema did make international news for another reason, when one of the FBI's top-ten most wanted, Jesse James Hollywood, was arrested there (that's really his name!). This guy seems to have been a real character... a true Californian bad boy, or teenage "gangsta", rather. At 5 foot five and 140 pounds, a product of white suburban middle-class Los Angeles, he had built up his own drug ring (formed mostly of kids that had played in Little League with him). At the age of 19, he was living on an income of something around $50 K / year dealing pot and had his own $200000 home just down the street from his father (who was also involved in some shady activities). At the age of 20, he was the youngest American ever to make the most wanted list, for kidnapping and murder of a 15 year old boy, brother of one of his rivals. His "gang" were all captured and tried, but he managed to flee. For five years, he lived anonymously, under an assumed name with false documents, first in Rio, then in Saquarema. I won't recount the whole story (but you can read it here if you want), however, I will say that it does have all the makings of a movie ... in fact, the story is being made into a movie (Alpha Dog, starring Justin Timberlake and Bruce Willis). And I will recount the ending of his story. Apparently, Jesse had always seen in the movies that, if you are on the run from the law, Rio de Janeiro is the place to go. Well ... it is true that Brazil doesn't have an extradition treaty with the US, and there have been precedents. But things are different these days; when Jesse was caught in March, he was deported summarily, in spite of the fact that he was living with a Brazilian woman who was pregnant with his child. The poor woman had no idea of his background; he had told her he was a Canadian student in Brazil to study portuguese. His deportation was guaranteed based on the fact that he was in Brazil illegally, with false documents. Still, it might have worked out if he had been smarter: apparently he was caught because he maintained contact with his father, who sent him $1000 each month for him to live on. Police tapped his father's phone line, so they knew for sometime that he was somewhere in Brazil. Brazilian Federal Police were alerted, and they finally figured out where he was; apparently, they set up a sting operation with his own father's collaboration, and arrested him in a little open-air shopping mall in Saquarema. So anyway, that's just a bit of trivia... not that big of a deal. It's kind of a curiosity to us, 'cause we hang out alot at the little shopping mall (Lake's Shopping), although I don't recall ever running across this guy. Lately, it's made my visits to Saquarema a little more interesting ... as if I didn't have enough prejudice against me just for being a gringo, now I have the additional stigma of sharing part of my name and nationality with an outlaw. I've caught a couple of double-takes, or at least curious looks, particularly when I flash a credit card in Saquarema (the James seems to stand out). So in honor of Jesse James, tonight I'm posting the first batch of pictures from Saquarema, most of which are from exactly the same Lake's Shopping, where he was taken into custody. We stopped there last Friday (July 15) for lunch, and for the kids to unwind a little. The pictures are here. Tomorrow I'll try and post the rest. see jim... that's what i'm talking about!!! I KNEW there had to be more than my regular commenters! welcome! speak up more often!!! how would I have ever come here otherwise!! What are you doing in Brazil ? thanks for dropping in ... glad to see you here as well! As to your question ... that's a big question! The short answer is, I'm married to a brazilian. I've lived here for 15 years ... so I guess I've pretty much "gone native". My family still lives in the KC area ... Mom in Blue Springs, Dad in Overland Park, brothers and sisters in Olathe. I guess I could ask what a Canadian is doing in Missouri just as well! Do you like it there ?